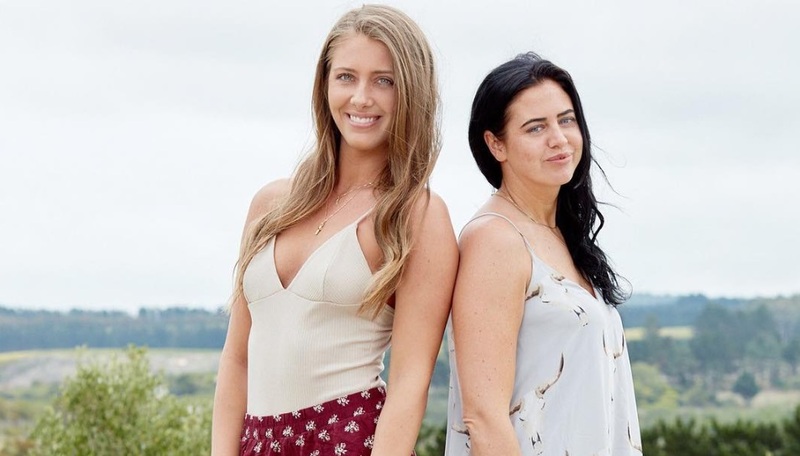 Loudmouth Jemmye and bubbly Jenna were never on one another’s radar, until Jemmye pulled the Double Cross and sent Jenna into elimination against her best friend, Kailah on The Challenge: Dirty 30. Jenna was blindsided by Jemmye’s iconic Challenge backstab that sent her to the Redemption House. Will their contrasting personalities be able to mesh together and lead to a vet win? SM consultant? Online boutique? What does this have to do with The Challenge? I hated her on Vendettas. Hopefully she stays home after this season. Especially cause she’s a bad competitor. She looks like Jenna's mom on their pic together. Unkess the photographer photoshopped that maternity dress and the longhorn skulls she has no one to blame but herself for that picture. She looks like a young pregnant Roseanne Barr at prom. Yikes. Her lips look horrible and thats her own damn fault. Outfit is horrible and thats her fault too. This a cleaning your house on a sunday morning oufit. It stays in the house. Like she had Jenna at 16 and is proud of the way their life has been even though she’s a single mom. Honey Boo Boo is a brunette now? Her style is always atrocious, that boutique can’t be selling much when the owner looks like she just rolled out of her double wide in her moms maternity handme downs. Her style is always atrocious, that boutique can't be selling much when the owner looks like she just rolled out of her double wide in her moms maternity handme downs. I cackled. God we drag the **** out of her. Lol at her blaming the photographer. He didn't make you look that way honey. Blame God. She looks like somebody's mom in 20 years or so. She really doesn't fit in with Jenna besides only making Jenna's beauty stand out even more. And she's blaming the photographer for looking like this though why exactly? She looks like The DUFF in that pic with Jenna. She looks like an awkward super fan from one of the Diem Fundraiser Scams who was trying to be cool posing with Jenna but just came off hell of awkward. I am living & simultaneously dying at this jemmye dragging. I don’t understand the hate or mean comments at all.. I think she is so pretty! I’m not sure if any of you have seen her in person before but she’s so tiny and really pretty. And like the picture is really not that bad?